Immersive experiences (VR, AR, and Mixed Reality) may be growing trends around the world but are less prevalent in the performing arts industry. Overall, VR and mixed reality is still in a phase of experimentation and growth. This makes it hard to fully define its general benefits or consequences to the performing arts as well as outline costs and potential benefits. The goal of the following research is to gain a better understanding of the reasons why performing arts organizations implement these kinds of technology and discover whether it was worth the investment at this time in the technology’s development. The analysis of implementations of these emerging technologies can be divided into four main categories: performing arts disciplines, financials, number of users, and purpose. Where does Immersive Technology Predominate? A sample of 12 performing art organizations, with 14 performances total, was collected for analysis of this study. The cases for this research included 9 theaters, 1 music, 1 dance, 1 horror (haunted house), and 1 arcade performing arts organizations which combined gaming and theater. Most of the organizations using these technologies were theatrical in nature. In addition, 7 of the organizations in this sample were for-profits as compared to 5 non-profits, which suggests this kind of implementation requires significant investment and risk more common in the for-profit sector. However, this seems to be changing, as multiple non-profit theater organizations in the U.S. have started to add VR/AR/Mixed reality in their programming. While the sample available is small, it reveals that each discipline had a different method and purpose for implementation. This is important to consider when thinking of applying these technologies. It was found, for instance, that music organizations were mostly inclined to use them as a method to demystify the experiences of newcomers and increase inclusion, dance companies to help audiences better understand stories behind the choreography, and haunted houses to encourage community collaboration. Theater, with the larger sample set, intersected all the purposes mentioned above, and hence, it is a more active industry for arts managers to study to better understand the benefits of utilizing immersive technology in performing arts. On the other hand, “Draw Me Close: A Memoir” co-produced by the National Theatre of London and the National Film Board of Canada, made the conscious choice of making the experience single-user. They wanted to offer a more “intimate encounter between the audience member and the performer” (Jordan Tannahill, 2019). The one-on-one experience allowed for higher empathic conversations and physical contact between the actress and audience member. CREW, a Belgium performing arts and technology organization, instead, chose to implement both kind of options, creating a single-user, “C.A.P.E. Drop_Dog (2016),” and a multi-user, “W (Double U)” experience. Multi-user immersive technology performances provide an entirely different experience to the user. They allow audiences to sit together in a shared physical space and be involved intimately either with each other, the characters in the performance, actors, and/or the performance itself. Multi-user experiences, in general, have a much wider range of possibilities and income-producing options. Hence, when considering which option to implement in your organization, these two choices should be kept separate and considered as completely different strategies with different costs and benefits. The purpose of implementing such technologies in the performing arts industry, as mentioned before, varies greatly. However, there are some recurring reasons for its use, which include community engagement, special effects, audience engagement, and reach. Heimbuch, Jeff. "Halloween Offerings From THE VOID Are A Scary Good Time." HorrorBuzz, September 12, 2018. https://horrorbuzz.com/2018/09/12/halloween-offerings-from-the-void-are-a-scary-good-time/. Some organizations are trying to encourage strangers in the audience to interact with each other, by either working together or taking on the role of different actors in the performance. These interactions often help increase empathy amongst community members who enjoy the experience together and gain a stronger understanding and appreciation for community and collaboration. Some organizations doing this kind of work include the 3-Legged Dog, CREW, Rimini Protokoll, and the Void. Void’s performance of “Nicodemus: Demon of Evanishment,” for instance, is a haunted house in which 4-players are put in a group and given a VR headsets and jetpacks and with instructions to work together to find a way out of a room that resembles the Chicago World Fair in 1894, with scenes and sets of how it used to be. "Giudizio Universale: Michelangelo and the secrets of the Sistine Chapel." Wanted in Rome, March 14, 2018 https://www.wantedinrome.com/whatson/giudizio-universale-michelangelo-and-the-secrets-of-the-sistine-chapel.html. The addition of some special effects used in immersive performances would be hard to accomplish without technology. Shows like “Giudizio Universale: Michelangelo and the Secrets of the Sistine Chapel,” whose stated goal is “to take the viewer to the center” of a historical event, would not be the same without the use of 270-degree projections, which make the audience feel they are in 15th-century Rome. Similarly, “C.A.P.E. Drop_Dog” by CREW, uses 360-degree film images projected through video-goggles and the help of omni-directional sounds, to take participants into different places and times in history, allowing them to jump from one part of the world to another within minutes. This experience lets audiences explore the space, living the story as if they were in it. Young Vic. "Draw Me Close." https://www.youngvic.org/whats-on/draw-me-close. Some other performing arts companies take the approach of involving the audience within the performance plot, characters’ lives, and the development of show cues to keep them engaged. An interesting approach was used by ATOM-r, a performing arts company that focuses on the intersection of performance, language, and emerging technologies to explore complex topics. In 2014, ATOM-r presented “The Operture,” a dance about the frustrations of an LGBT man who, in trying to repress his sexuality, became a tattoo-maker. Knowing that it is hard for audiences to understand the full story just by watching, the creators developed a phone app that could be used to scan the dancer’s tattoos to read more about their personal stories before, during, and after the performance. Another experience, completely different but with a similar goal was “Elements of OZ” by The Builders Association. In this performance, audiences were asked to download an app to collaborate in the creation of sound and video cues during the performance. Lastly, a different approach was taken by both, “Draw Me Close: A Memoir”& “Chained,” in which they changed the role of the audience member by making him/her a character in the play. Sheil, Geoff. "Tonight, the Maryland Opera Studio performs for the @Univ_System_MD Board of Regents." UMIACS Twitter. https://twitter.com/umiacs/status/935618934023360512. It was also found that some organizations choose to use these immersive technologies to welcome inclusion of those who were unable to attend the performance, either because of sickness, economic circumstances, time/distance, and/or uninterest. A great example of this is the Maryland Opera Studio, who partnered with the Maryland Blended Reality Center to start offering 360-degree videos of the stage and orchestra pit during live concerts on VR. This implementation was targeted towards sick patients in hospitals and others who couldn’t attend the performance live. For them, the VR experience is a way to enjoy the performance with their loved ones from apart. The experience is also targeted towards newbies and traditional audiences. For new concert goers, the VR experience is an access point to demystify their previous judgments about orchestras; and for traditional audiences, the goal is to give them an improved experience, in which they can be “sitting in the driver’s seat” looking at the concert from the middle of it all (Carroll, 2018). The uses, purposes, and industries involved is growing and vast. Still to be discovered are the benefits and challenges of immersive technologies in the theater industry for each purpose and whether it is worth the investment at this moment in time. Heller, Scott. 2019. “Extending the Stage with Technology.” The New York Times, January 25, 2019, sec. Theater. https://www.nytimes.com/2019/01/25/theater/theater-technology.html. WGBH. "Hamlet 360: Thy Father’s Spirit – Shakespeare in VR." YouTube. January 24, 2019. https://www.youtube.com/watch?v=Jc88G7nkV-Q. "Thy Father’s Spirit: Introducing Hamlet In 360-Degree Virtual Reality." WGBH, January 22, 2019 https://www.wgbh.org/hamlet360. Young Vic. "Draw Me Close." https://www.youngvic.org/whats-on/draw-me-close. Tannahill, Jordan. "Jordan Tannahill." http://www.jordantannahill.com/. CREW_Online. "Project - C.a.p.e. Drop_Dog " (2016). http://www.crewonline.org/art/project/704. CREW_Online. "Project - W (Double U)" (2008). http://www.crewonline.org/art/project/51. 3-Legged Dog. http://www.3ldnyc.org/. Morales, Victor. "Skiff/Faustroll." allevents.in, February 2017 https://allevents.in/new%20york/skiff-faustroll-by-victor-morales/370291923335448. Haug, Kaegi, and Wetzel. "Situation Rooms - A multiplayer video piece." Rimini Protokoll. 2013. https://www.rimini-protokoll.de/website/en/project/situation-rooms. Rimini Protokoll. "About Rimini Protokoll." https://www.rimini-protokoll.de/website/en/about. Becker, Tobias, and Wolfgang Höbel. "Audience-participation theatre for laymen." DER SPIEGEL, March 22, 2019. https://www.rimini-protokoll.de/website/en/text/audience-participation-theatre-for-laymen-1. The Void. "NICODEMUS: DEMON OF EVANISHMENT." https://www.thevoid.com/dimensions/nicodemus/. Gagne, Yasmin. "Exclusive: The Void announces new Disney and Marvel hyper-reality experiences." Fast Company, September 12, 2018. https://www.fastcompany.com/90234984/exclusive-the-void-announces-new-disney-and-marvel-hyper-reality-experiences. Raphael, Rina. “Virtual Reality Reimagines the Haunted Mansion–with Eerily Realistic Effects.” Fast Company, October 1, 2018. https://www.fastcompany.com/90234145/virtual-reality-reimagines-the-haunted-mansion-with-eerily-realistic-effects. Cascone, Sarah. "Sistine Chapel, the Ride? See Inside Michelangelo's Masterpieces in Rome's High-Tech Theatrical Production." Artnet News. October 05, 2018. Accessed October 23, 2018. https://news.artnet.com/art-world/giudizio-universale-michelangelo-sistine-chapel-1360087. Solsman, Joan E. 2018. “This VR-Live Actor Mashup Is like Your Best Absinthe-Fueled Nightmare.” CNET. CNET. November 29, 2018. https://www.cnet.com/news/a-vr-theater-mashup-of-a-christmas-carol-jolted-a-shriek-out-of-me/. Ungerleider, Neal. "Inside Los Angeles’ Virtual Reality Haunted House." Fast Company, October 31, 2016. https://www.fastcompany.com/3064634/inside-los-angeles-virtual-reality-haunted-house. MacDonald, Brady. "Halloween Haunt now admitting patients to a virtual reality hospital." LA Times, September 6, 2016. https://www.latimes.com/travel/themeparks/la-tr-halloween-haunt-virtual-reality-5150-20160905-snap-story.html. Artainment Worldwide Shows. 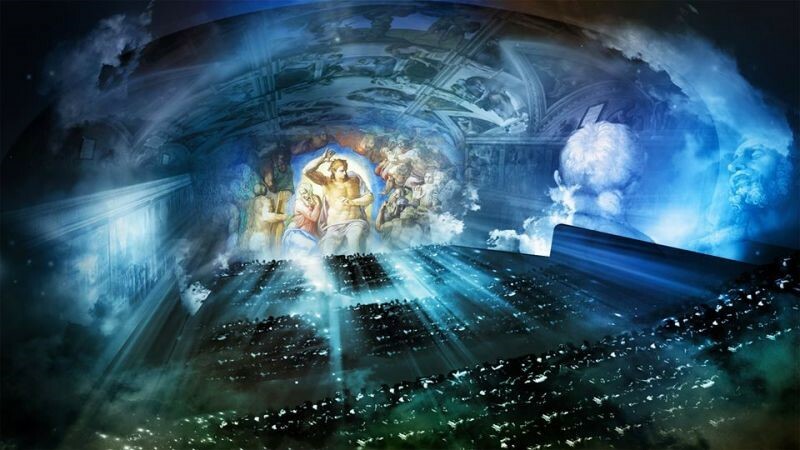 "Guidizio Universale: The Sistine Chapel Immersive Show." https://www.giudiziouniversale.com/en/. ATOM-r. "ANATOMICAL THEATRES OF MIXED REALITY." atom-r.com. Cutie, Jena. "The Operature: Dance inspired by a former professor's "stud file"." Chicago Reader, March 19, 2014. https://www.chicagoreader.com/Bleader/archives/2014/03/19/the-operature-dance-inspired-by-a-former-professors-stud-file. Feldman, Adam. "Theater review: Elements of Oz takes audiences on a high-tech rainbow tour." TimeOut New York, December 7, 2016 https://www.timeout.com/newyork/blog/theater-review-elements-of-oz-takes-audiences-on-a-high-tech-rainbow-tour-120716. The Builders Association. "ELEMENTS OF OZ." http://www.thebuildersassociation.org/prod_oz.html. "CHAINED PERFECTLY BLENDS VIRTUAL REALTY & IMMERSIVE THEATER IN THIS CLASSIC TALE." Madison Wells Media, November 29, 2019. https://www.madisonwellsmedia.com/news/archive/2018/11/29/chained-perfectly-blends-virtual-realty-amp-immersive-theater-in-this-classic-tale. Solsman, Joan E. "This VR-live actor mashup is like your best absinthe-fueled nightmare." Cnet, February 25, 2019 https://www.cnet.com/news/chained-vr-live-actor-mashup-is-like-your-best-absinthe-fueled-nightmare/. MWM Immersive. "Chained: A Victorian Nightmare." https://www.becomechained.com/. Carroll, Chris. "Virtually Onstage: UMD Artists, Researchers Open New Views of Opera." TERP Magazine, October 1, 2018 http://terp.umd.edu/virtually-onstage/#.XGrVOOhKjIU. University of Maryland. "Maryland Opera Studio: New Works Initiative." http://www.music.umd.edu/ensembles/opera/new-works. Karp, Rachel. "Mixed Reality Performance: In Conversation with Yehuda Duenyas." Contemporary Performance, December 2, 2017. https://contemporaryperformance.com/2017/12/02/mixed-reality-performance-conversation-yehuda-duenyas/. Duenyas, Yehuda. "Yehuda Duenyas: Experience Artist, Creative Director." Yehuda Duenyas. https://xxxyehuda.com/about/. Karp, Rachel. "Have You Heard About Mixed Reality Performance?" Contemporary Performance, December 1, 2017. https://contemporaryperformance.com/2017/12/01/what-is-mixed-reality-performance/. Seymour, Lee. "The Royal Shakespeare Company Paves Way For Virtual Reality Theater." Forbes, January 10, 2017 https://www.forbes.com/sites/leeseymour/2017/01/10/the-royal-shakespeare-company-is-paving-the-way-for-virtual-reality-theater/#1df95b4834b1. Royal Shakespeare Company. "A NEW MAGICAL TEMPEST." https://www.rsc.org.uk/news/archive/a-new-magical-tempest.